1.No need to install drivers, it is easy to portable, flexible, plug and play and no need extra cable, just save your money. 3.Please connect the USB power cable (included in the package) to get this video converter cable work perfectly. 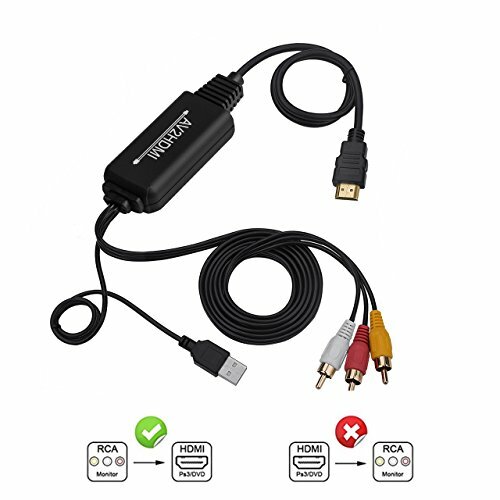 AV to HDMI Converter Cable: This RCA to HDMI converter cable convert RCA, AV,3rca CVBS Composite video audio signal to HDMI 1080P (60HZ) Output signal.Note: This HDMI to RCA converter cable is convert RCA to HDMI only, Not support HDMI to RCA and AV. 1080P HDMI Quality Supported: The AV to HDMI converter cable has n built in authentic HD chip that supports advanced signal processing with resolutions scale up to 1080P HDMI. Please Note: This RCA to HDMI adapter does NOT support 3D. Widely Compatibility: RCA to HDMI Cable supports PAL, NTSC3.58, NTSC4.43, SECAM, PAL/M, PAL/N standard TV formats input signal. Input ports: 1 x RCA (Yellow, White, Red color cable). Output ports: 1 x HDMI (1080P/ 60Hz). Widely applied to TV/ PC/ PS3/ STB/ Xbox VHS/ VCR/ Blue-Ray DVD Players Projector. Plug and Play: Easy to hook up, plug and play, no drivers needed. Convenient all-in-one cable is equipped with RCA to HDMI chipset so you save money and avoid dealing with multiple components Powered by a standard 5V/1A mini USB port (USB cable is offered in the product). Please connect the power cable at first when using this RCA to HDMI converter. What You Get: Purchase your RCA to HDMI Converter Cable and If you are not satisfied send it back within 30 days for a full refund. We also provide this AV to HDMI converter cable 365 Days warranty. If you have any questions about this product by Anber-Tech, contact us by completing and submitting the form below. If you are looking for a specif part number, please include it with your message.